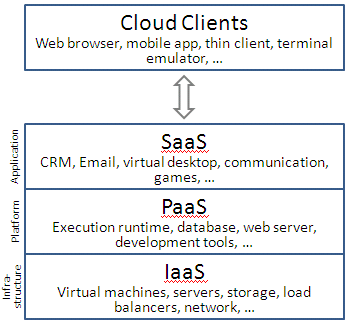 ﻿ Cloud Solutions 101 - What is a Cloud Client? What is a Cloud Client? A Cloud Client consists of computer hardware and/or software that relies on cloud computing for application delivery A Cloud Client could also be specifically designed for delivery of cloud services. In either case, the Cloud Client is essentially useless without Cloud Services. Examples of Cloud Clients include some computers, phones and other devices, operating systems and browsers. Users access cloud services by using networked cloud client devices, such as desktop computers, laptops, tablets and smartphones. Some cloud clients rely on cloud computing for all or a majority of their applications so as to be essentially useless without it. Examples are thin clients and the browser-based Chromebook. Many cloud applications do not require specific software on the client and instead use a web browser to interact with the cloud application. With Ajax and HTML5 these Web user interfaces can achieve a similar or even better look and feel as native applications. Some cloud applications, however, support specific client software dedicated to these applications (e.g., virtual desktop clients and most email clients). Some legacy applications (line of business applications that until now have been prevalent in thin client Windows computing) are delivered via a screen-sharing technology.